Happy Holidays From York University! From all of the faculty and staff here at York University, we would like to wish you and your families a very joyous, fun-filled, happy, and safe holiday season! We are excited about all of the wonderful happenings that will be taking place in 2017, and we look forward to connecting with you in the new year! Read a message from The Office of Alumni Engagement's Executive Director, Guy Larocque. Missed the previous issue of the Alumni Matters newsletter? Dive into our Alumni Matters archive and see what stories you may have missed! Car shopping? Affinity partner, TD Insurance, has a handy tool that allows you to compare insurance premiums for different vehicles. Check it out! Buying a new car? Unhaggle Premium Concierge customers save an average of $3,184 of MSRP. Alumni now get 20% discount for this valuable Unhaggle service. Check out this new offer! York University Alumni could have $5,000 new reasons to give back. 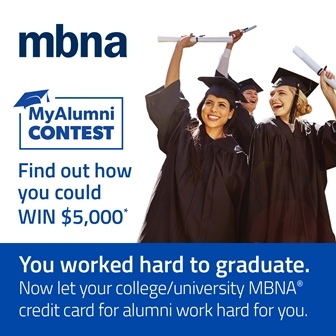 Find out how with the York U MBNA® MasterCard®.